The First Lady of the United States dropped by the Comedy Central program to discuss her Joining Forces initiative and banter with the late-night host. 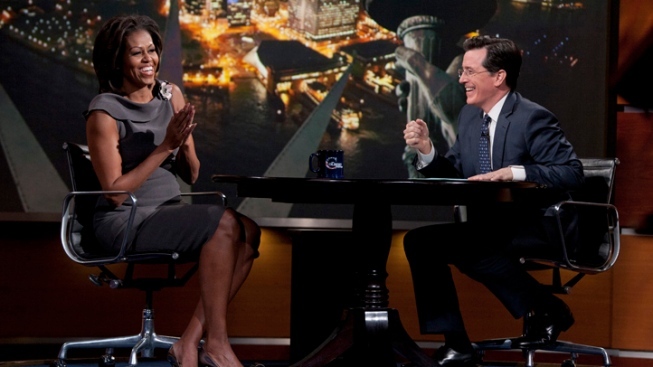 First Lady Michelle Obama laughs with Stephen Colbert during her appearance on Comedy Central's "The Colbert Report." First Lady Michelle Obama appeared on Wednesday's edition of "The Colbert Report" to discuss her new initiative with Dr. Jill Biden: Joining Forces, a program designed to assist military families and help veterans find employment after returning from tours of duty. Stephen Colbert, adopting a slightly toned-down version of his standard schtick, couldn't help but steer the conversation back to himself. "The last time you were here you were not First Lady—and now you are," Colbert said. "That's called the Colbert bump." Later, Colbert grilled the First Lady on a key issue of the 2012 presidential campaign: Nickelodeon's "iCarly." "As someone who has both appeared on my show and 'iCarly,' which of us has more gravitas?" Colbert asked. The First Lady didn't provide a definitive answer, but played along with the gag. "iCarly is about sixteen, and she's real deep," she said. "I should add some random dancing to my show," Colbert quipped. Later in the interview, First Lady Obama discussed what attracted her to working with veterans. Colbert chimed in: "I served in Iraq for almost a week [for the USO], so I consider myself a veteran." The host topped off the interview by asking the First Lady if she ever ribbed her husband on the fact — according to some polls — that she is more popular than him. She laughed. First Lady Obama doesn't tease the President, of course.